Well, it's that time of year again...back-to-school! My social media feeds are filled with the smiling faces of backpack-laden kids and tots getting ready for their first day of school. Moms across the country are simultaneously shedding tears and popping champagne! (or is that just me?) I love summer, but I'm not going to lie...these last few weeks have been incredibly hard. Mac has been a holy terror (even more so than usual) - he's been pushing the boundaries, back talking and harassing Mim like it's his full-time job. He's become a pro at pushing my buttons and seeing just how far he can go before he lands himself in time out (for the 600th time that day). His camps are over and these last couple weeks of unstructured days have taken their toll on him (and us). He needs to get back on a set schedule, back in the classroom and back around kids his own age. (Mim needs a break). We are ready! That being said, we still have three more weeks before school starts for us. In the meantime, I've been stocking up on all the essentials for him to have at school and at home and looking for the perfect gifts to give his teachers to butter them up (or just profusely apologize) for him. There are so many adorable items for kids, teachers and classrooms these days. Here are a few of my favorites. Wildkin Dinomite Lunch Box - Mac had to take a lunch to swim camp over the summer, so I got him this adorable dinosaur lunch box from Wildkin. They have all kinds of cute colorful prints for boys and girls with coordinating backpacks. They're insulated, roomy (but not huge) and easy for little ones to get into. North Face Mossbud Swirl Jacket (girls) - I'm obsessed with this gorgeous reversible jacket for girls. It's a pretty ice green water-resistant puffy coat on one side or a soft grey fleece on the other. If I can find this in adult, Mim and I may be sporting these matching jackets this winter. Super States of America Map Print - I love this colorful print of the U.S.A. from Minted. This would look great hanging in your child's playroom or homework station. Or it would make an awesome teacher's gift for the classroom. French Bull Plaid Backpack - There are so many great backpack options for kids right now. Everything from trendy and fun to superhero or character. I'm a big fan of simple and colorful, so I love this plaid backpack from French Bull. It's small enough for a preschooler to carry, but will also work for kids up to age 10. Work Hard & Be Nice Print - I love this simple print from Minted. This would make a great teacher's gift or serve as a nice little reminder in an office or playroom. North Face Glacier Zip Hoodie (boys) - North Face makes the best kid's fleece jackets and this one is really cute for toddler boy. I love the hood and the soft fleece inside. Fully reversible and machine washable (a must for kids that are as messy as mine). KicKee Pants Pajamas - It's super important right now to make sure your kids are getting enough sleep so that they can concentrate in school. KicKee Pants are above and beyond our favorite brand of kids pajamas. KicKee is made from bamboo and is the absolute softest material. It comes in a million different prints, patterns and colors, and a variety of styles (2-piece, footies, coveralls, etc.) My two spend half their lives in KicKee and they refuse to wear anything else to bed. Favorite Colors Clothing Labels - If your kids are anything like mine, they shed layers of clothes throughout the day and don't give a second thought to where their stuff ends up. I love these clothing labels from Minted that attach to the clothing tag and are machine washable. Hopefully this will help cut down on missing items of clothing over the school year. Macarons Personalized Notebook - Older kids (and parents and teachers) are going to love these personalized notebooks from Minted. Choose from a million designs and colors to reflect your kid's personality and/or hobbies. Perfect for keeping track of homework assignments or schedules. Onaroo Teach Me Time Talking Alarm Clock - Teaching Mac how to tell time has been on my list of things to work with him on this year, which is why I'm super excited about this clock. The clock gives the time in digital numbers as well as a traditional clock face. Plus, it has a night light and talks to tell your little one what time it is. Flyball Custom Name Labels - How adorable are these personalized baseball name stickers? These would be perfect for school supplies, lunch boxes, water bottles, sports equipment and toys. They're dishwasher, laundry and microwave-safe. Seeds of Knowledge Wall Art - This apple print from Minted would be such a cute gift for a teacher or perfect for your kid's homework station. There's also a similar one in gold, if you want to get fancy. Educational Insights Talking Globe - Our local library has a globe like this one and my kids are obsessed with it. This talking globe asks over 10,000 geography-related questions and gives you hints for those you may not know. Perfect for kids learning about the world and interested in maps. Olive Kids Paisley Pencil Case - Carry your pens and pencils in style. I love this pink paisley case from Olive Kids. It's the perfect size for a desk or backpack. Nike Tennis Shoes - My kids both love their Nike kicks. These adorable sturdy and colorful shoes have velcro up top, which make them easy for little kids to put on by themselves. They come in a variety of colors, styles and widths. 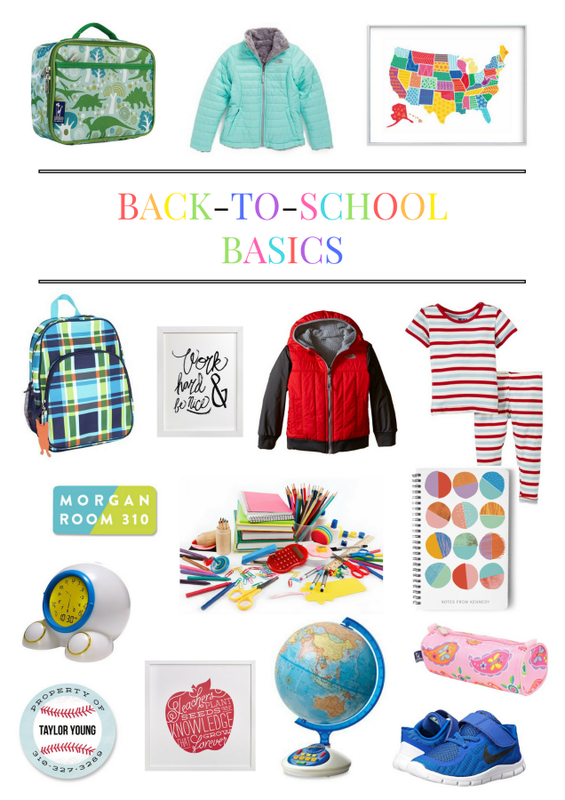 What are your favorite back-to-school products? * Thanks to Minted for inspiring and sponsoring this post. Contains affiliate links. All opinions expressed regarding products and excitement for new school supplies belong to me! * FYI - if you order any stationery products from Minted this summer, they will come packaged in a uniquely themed box that unfolds into a fun cut-out costume! Post a creative photo of you or your little one modeling and upload it to the #MintedBox project site for a chance to win a gift certificate. Girl I hear ya! I'm no ready for the fun of summer to be over, but goodness we are ready for the routine again. We love the pool but that's even getting a bit old. I love everything you posted. You always find the best things. Love your list and YES, routine please!!! I love the colorful map from Minted! They are getting so many cute new decor items and wall art! Aubrey has been wanting to tell time- I'll have to look into that clock! School supply shopping is one of my favorite things to do! What a great list! I'm going to have to try those jammies for my kids. And what cute labels for clothing! Just what my kiddos both need. Yeah, I both celebrate and cry at the end of the summer. We start school tomorrow! We have that exact clock! So many cool features on it. Love these kinds of posts! I love these and that print! And I'm ready for day light savings time so I don't hear "it's LIGHT outside" every night at bed time - haha!!! These are such great finds! I need to order some labels stat! Age 4 has brought the back talking. Fun times for all. And Minted, Kickee, & North Face are practically my love languages! As much as I do not want school to start back, I do love school shopping. I just wish Mason didn't have to wear uniforms. This is a great roundup. I fully need to invest in some name labels for Marcus. And that boys Northface jacket is awesome. I have no idea when Marcus would ever wear it (maybe when we visit the Midwest? ), but I feel like he needs it anyway. Do not be discouraged by poor grades.It is not necessary that learning implies beating in the class, once in a while the dissertation writing services best individuals in life are those with horrible score yet extraordinary insight.